Martha Stewart is no longer confined to her home, much less the kitchen! 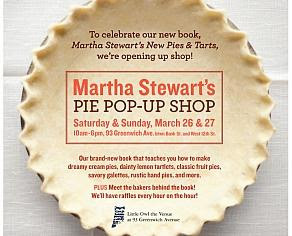 Stop by Martha Stewart’s pop-up pie shop at Little Owl today for a slice (or two!) of sweet and savory heaven. As a special promotion for her new cookbook, New Pies & Tarts, you’ll get to meet with the confectioners and contributors to the book and delight in their signature cream pies, fruit tarts, and savory galettes, which are all recipes straight from this delectable cookbook.